Over the span of his 63-year career, Gerard “Gerry” M. Turino, MD, has earned several awards and the reputation of being a legend in the pulmonary and internal medicine world and a lion in COPD and Alpha-1 support. But the venerable physician-scientist and former ATS president is hardly one to put on airs. He’s a product of the Greatest Generation—diligent and compassionate—and he continues his practice and research today. In May, during the ATS 2013 International Conference in Philadelphia, Dr. Turino will be recognized at the Fifth Annual ATS Foundation Research Program Benefit as the ATS 2013 Breathing for Life Award winner. 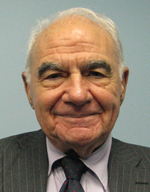 Dr. Turino continues much of his research and clinical work at the James P. Mara Center for Lung Disease in St. Luke’s and Roosevelt Hospitals Division of Pulmonary, Critical Care, and Sleep medicine in New York City—a program that he helped create nearly 14 years ago after being named director emeritus of St. Luke’s and Roosevelt Hospitals Department of Medicine. He’s also John H. Keating professor emeritus at Columbia University. At the James P. Mara Center, Dr. Turino oversees patients living with COPD and nearly 50 with Alpha-1 antitrypsin deficiency. “There’s a lot of outreach to the patient population in addition to the research and critical care that’s being administered here,” he says. Dr. Turino’s research focuses on the mechanisms of lung matrix injury and lung matrix remodeling; alveolar capillary fluid flux; lung elastin peptide quantification as a measure of alveolar matrix injury; and the evaluation of specific protease inhibitors in the therapy of certain diseases of the lung. He has more than 185 papers and reviews and nearly 77 abstracts to his credit, and his investigations have received both private and public funding. For more than 35 years, Dr. Turino has collaborated with Jerome Cantor, MD, associate professor of pharmaceutical sciences at St. John’s University in New York. “Gerry pioneered our current understanding of the pathogenesis of pulmonary emphysema, and made seminal contributions to the field, specifically in regard to the relationship of elastase to lung injury,” Dr. Cantor says. “Most recently, he has incorporated the use of mass spectrometry in developing a reliable biomarker for elastic fiber damage in COPD. This marker offers the promise of real-time assessment of the effects of therapeutic agents for COPD and will facilitate the evaluation of new agents that might have otherwise been overlooked. “That strong environment in cardiopulmonary physiology greatly influenced me,” Dr. Turino confirms. His fellowship under noted physiologist and clinician Alfred P. Fishman, MD, further influenced him, as they investigated tissue destruction in the lung that leads to emphysema as well as “early work in diffusing capacity of the lung,” Dr. Turino says. Dr. Turino became heavily involved in the study of Alpha-1 antitrypsin deficiency after its discovery in 1963 of by Swedish researchers. His contributions led to New York becoming a hub for Alpha-1 research. Throughout his career, Dr. Turino has never lost sight of the patient perspective, and he’s provided support and insight to the Alpha-1 Foundation and helped found the COPD Foundation, which he continues to serve as a board member. A member of the ATS since 1972, Dr. Turino has taken on the most important leardership roles. He served as president in 1987–88 and in several committees, assemblies, and task forces. He continues to lend his insight to the Documents Development and Implementation Committee and the ATS Foundation.